The Norwegian veterans continue to defy black metal purists on their seventh album. Traditional Norwegian black metal continues to thrive, with bands faithfully adhering to the genre's formula, set in the early to mid-'90s. But it's interesting how several bands which were there at the beginning have since distanced themselves from the tremolo picking, trebly, atmospheric production, and of course, the corpsepaint. Darkthrone, whose A Blaze in the Northern Sky helped set that template, has ditched black metal entirely, its last three albums delving more into a thrashy, crust punk direction. Enslaved has gradually incorporated progressive rock elements into its ever-evolving sound, to the point now where it's only a matter of time before the traces of black metal disappear entirely. 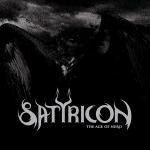 And Satyricon, the duo of vocalist/multi-instrumentalist Satyr and drummer Frost, has in recent years chosen to move backwards, regressing and simplifying its sound in a way that strips everything to the bone. A polarizing move, especially in the insular black metal community, but as 2002's Volcano and 2006's Now, Diabolical proved, Satyricon has taken to the stripped-down, riff-centric style remarkably well. Aside from Satyr's new haircut/aviators look, which makes him a dead ringer for Andrew Eldritch circa 1987, not much has changed with Satyricon, except for the fact that the band is clearly finding a good comfort zone within the niche the last couple albums have created. But although that news will elicit groans from those craving a return to the days of 1996's Nemesis Divina, The Age of Nero is still a spirited piece of "black 'n' roll" that makes no apologies for sounding accessible. Just as he did on Enslaved's excellent Vertebrae, mixer Joe Barresi lends a valuable hand to Satyr's production, adding an analog-like warmth to the new record -- but whereas Vertebrae created a lot of space between the instruments, the overall effect on The Age of Nero is a lot more suffocating. The guitars are tuned lower and have a flatter, drier quality, stressing the physicality of the riffs, while Frost's drums are almost completely devoid of reverb (reminiscent of Rick Rubin's drum sound of the late '80s), which helps create a massive-sounding bottom end. Couple that with Satyr's predilection for slow, string-bending riffs that hearken back to the early days of Celtic Frost, and you've got a surprisingly formidable album. The opening "Commando" teases listeners with its icy intro and breakneck pace, but it's not long before Frost downshifts into the more lugubrious, mid-paced groove that dominates much of the album. "The Wolfpack", "The Sign of the Trident", and "Black Crow on a Tombstone" are so straightforward in their approach that it's jarring, but crammed with some of the catchiest guitar work Satyr's ever come up with, and plenty of lines begging for crowd shout-alongs. The three tracks prove how a good, simple riff can be all you need to make a superb metal tune. Having previously appeared in single form in early 2008, "My Skin is Cold" is dominated by Satyr's slow, open-ended doom riffs, while the brooding "Last Man Standing" is so indebted to Celtic Frost's Morbid Tales that it practically begs for a vocal cameo by Thomas Gabriel Fischer. For all the straightforwardness and deliberate pace, we do get sporadic moments that do bridge that 1980s sound with a decidedly more extreme influence. The seven-minute "Die By My Hand" starts off with a nod to Satyricon's black metal past, the blistering riff and blastbeats giving way to a much darker, funereal passage and vice versa, creating a very effective ebb and flow. Still, such instances are fleeting, as the duo leans heavily on the slower material. The Age of Nero climaxes with the lengthy "Den Siste", Satyr sneering his Norwegian lyrics in his distinctive snarl, Frost only adding fills when necessary, keeping the beat as skeletal as possible. The guitars culminate in a bizarre, morbid march underscored with a subtly blaring, almost ludicrous-sounding synth. These guys might be a long way form the early sounds of Norwegian black metal's nascent period, but this palatable record is just as capable as creating a suitably grim mood.